T-shirt artwork created for the Diocesan Vocation Discernment Retreat in Singapore which took place this weekend (for young men discerning the Diocesan Priesthood). 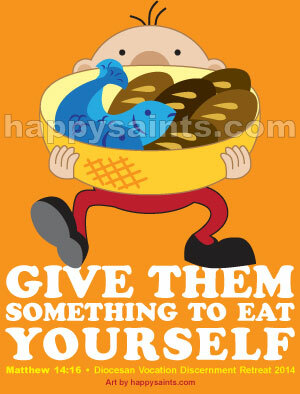 The theme was based on this Sunday's Mass Gospel Reading: 'Give them something to eat yourself'. The full-color design is shown here. The final design was printed in 2 colors to save cost.